Cheval Buddy system – There is whatsapp group to facilitate making arrangements with other members who may be looking for someone to accompany them to either a show or a clinic or to school with someone in Cheval the grounds. If you would like to be included on the whatsapp group please text Angela. There is no requirement to be on the group so if you have been included and would prefer not to be, just let us know we can remove you from the group. Good luck to all our members who have new mounts – please let us know how you’re getting on. Mental Performance Coach held in February certainly gave us plenty of food for thought on how to maximise performance by putting in place the necessary mental strategies to help us perform at our best. A huge thank you to Poppy for her time, Rachael for organising and all those who attended. The event was well attended and raised much needed revenue for the club. Well done to the Cheval riders competing in our dressage league Sandra Hannigan is currently lying 2nd in the walk trot on her four year old Yukon Pearl. Elaine Phillips, Triona Dever, and Geraldine Farrell are 1st, 2nd and 4th respectively in AP, but its still all to paly for as there are two more legs! Thank you to our writers so far Sarah Cashin and Ger Gaul for there help with the first two legs. Dressage and Show Jumping Teams – Laura Carrick and Elaine Philips have been doing a great job organising and coordination teams for the RDS SJ qualifiers and the NER Dressage Championships qualifiers. 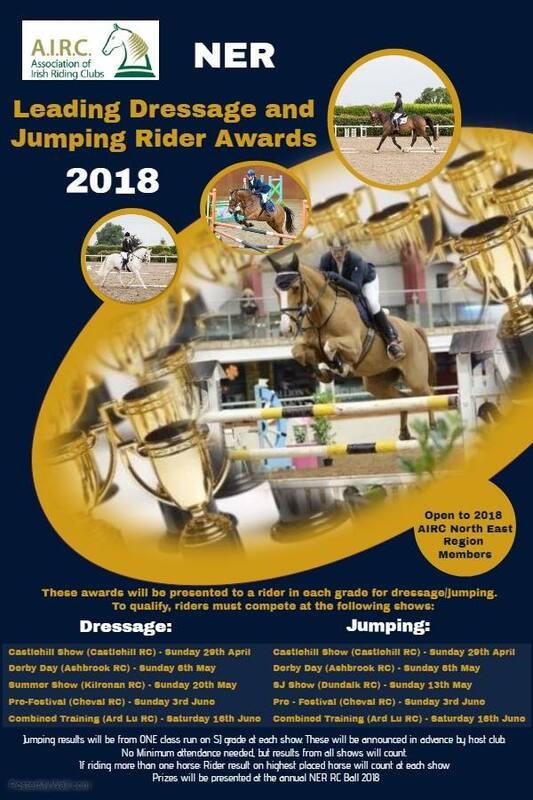 Show jumping teams have to be submitted in May at this stage you should be in contact with Laura if you are interested (inter & above) – REMEMBER if your horse is not registered with the AIRC by May 1st you cannot participate. Dressage team selection will be made after a selection day held on 5th of May in Cheval. Please contact Elaine if you want to take part (all grades). 2018 membership – Membership form is available online or contact Karen at info@chevalridingclub.com we will be taking new 2018 members. Cards will not be processed without completed membership form and payment. We are experiencing large delays with card processing – head office is taking a longer than normal time to turn around cards. Please keep this in mind. Cheval Leaderboard – each year we keep a record of how club members are getting on and then have end of year awards based on results. Results of AIRC shows and Cheval open to all shows are eligible for the leader board. 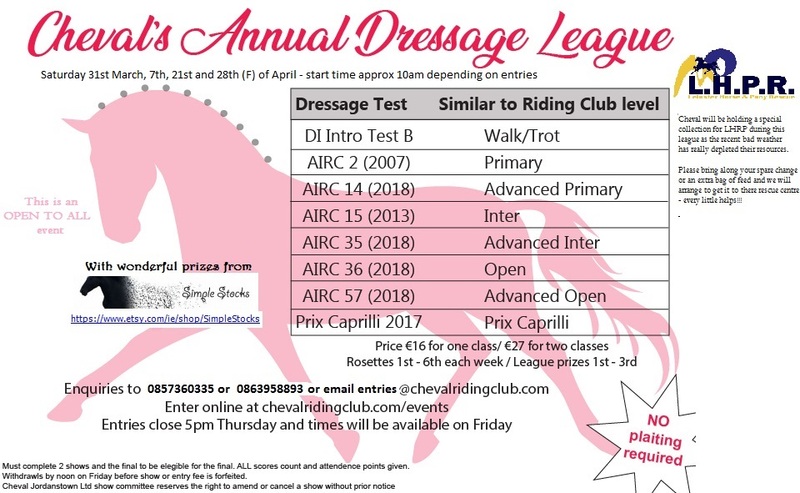 Rules are staying the same as last year and will be circulated by email – but it is up to you to submit your results to Leaderboard@ChevalRidingClub.com in order to be counted. NER leading rider awards – The NER has introduced a fantastic new leading rider award. A scoreboard will be kept over the NER summer shows for a leading Dressage and Jumping rider at each grade. These awards will be presented at the annual NER ball toward the end of 2018. Details included in the attached poster. The calendar is chock a block for 2018 – far too many to mention here so we have just listed some of the upcoming dates. We do our best to keep it up to date, but please always check with event organisers. The 2018 AIRC will be released this month. Over 80 classes will be on offer at this year’s Riding Clubs Festival which takes place on Saturday 9th and 10th June 2018 at Mullingar Equestrian Centre, Co. Westmeath. The same programme of classes in dressage, show jumping and showing will be on offer again this year at the two-day show. There will, however, be a few tweaks to the format of a small number of classes in showing and dressage. The dressage programme includes the same programme as last year with individual classes along with dressage to music, long arena, musical ride, prix caprilli, pairs and team competitions. There is one minor change to the dressage to music class for advanced intermediate, open and advanced open riders as it will now take place in a 20m x 40m arena. Competitions will run from 9am each morning until approximately 5pm or 6pm depending on the number of entries while the musical ride will take place on Saturday evening. The free consultation is designed to assist those members who feel that they might have an injury, unexplained pain, reduced flexibility, joint stiffness, muscle imbalance or a postural problem, however are unsure of whether this can be treated and if so how and by whom. It is worth noting if you have health insurance you may be entitled to a further discount. Remember your AIRC card also gives you a discount in the Horse Mad Store (sponsors of the Spring Show) and Whites Argi! The grounds are available for members to use schooling. You can also bring a non-member along for €15. Common sense and above safety rules apply. Please let us know if you notice any damage or issues on the grounds or if something breaks. Please do not ride on the grass in wet conditions as it only leaves the ground in bad shape for our summer season. 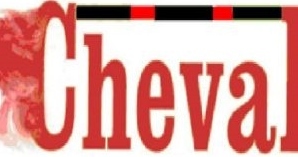 Safety remains of utmost importance to Cheval. With the increasing number of lawsuits insurance prices are on the rise. The AIRC’s own insurance went up 40% last year – and for Cheval insurance is our biggest annual expenditure. We must be vigilant to ensure all accidents are avoided and when they do happen we follow a strict protocol. This will help lessen the chances of the club being sued. Please be reminded no one can ride in the grounds without a competent person with them. This person must be able to call for an ambulance and give directions in the worst case scenario. At all times whilst mounted a riding hat (up to current AIRC standard) must be worn and must be fastened closed. A body protector is recommended for jumping. If you have a fall or have an accident you must report it to a member of the show committee or the entries desk – you will be required to fill out an accident report form before remounting. If you see anyone fall – ensure they fill an accident report form before remounting – we need all members to help with this as if Cheval’s insurance increases so will your membership. Be vigilant – if you see anyone acting in an unsafe manner you can ask them to stop or report it to a member of the committee urgently – remember Cheval is your club and your responsibility. We will be providing members with some training on how to complete an incident report form – the more detail provided in this form the better as it can help avoid law suits down the line. Conduct themselves in a manner detrimental to the character and/or prejudicial to the interests of Cheval Jordanstown CLG, Cheval Riding Club CLG, AIRC or a third party. Make, either orally or in writing, to an officer of Cheval Jordanstown CLG, Cheval Riding Club CLG, AIRC or a third party, a statement on a matter covered by the Rules which they know to be untrue.